A coconut curry dressing transforms roasted sweet potato, hearty farro and peppery arugula into a sweet and mildly spicy salad. This flavorful salad makes for a healthy, plant-based entrée or versatile side dish. Timing Note: If serving warm, time the sweet potato to finish roasting at the end of salad assembly. Preheat oven to 425°F (220°C) and line a large baking sheet with parchment paper. Cook the Farro: In a large saucepan, cook the farro per the packaging instructions until the farro is tender and chewy. Remove from heat and let rest for 5 minutes. Drain off any excess water and return the farro to the pot, cover to keep warm. Set aside. For crispier potatoes, remove the leeks once roasted and return the potatoes to the oven for an additional 3 to 6 minutes or until they are crispy and browned. Set aside and let cool slightly before adding to the salad. While the sweet potato and leek is roasting, prepare the dressing and assemble the salad. To Make the Dressing: In a small bowl, whisk together the coconut milk, mango chutney and curry powder. Place the bowl of dressing in the refrigerator until needed. 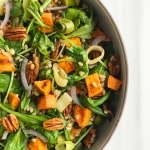 To Assemble the Salad: In a large bowl, combine the arugula, farro, red onion, raisins, pecans, roasted sweet potatoes and leeks, and gently toss until combined. Next, pour the prepared dressing over the salad and toss again until evenly coated. Serve immediately. To Make in Advance / To Store: For best results, keep the arugula and dressing separate from the other ingredients. Toss to combine just before serving. However, you can refrigerate leftover salad that has already been dressed but I have found the dressing flavor weakens a bit and the arugula wilts. Enjoy by the next day. Whole Grain Farro vs. Pearled Farro: Allow extra time for cooking whole grain farro, typically 25 to 40 minutes. Pearled farro is a quick cooking type, usually under 15 minutes. How to Cook Whole Grain Farro in Less Time: To shorten the cook time for whole grain farro, soak the farro overnight in a bowl of water in the refrigerator. Drain and rinse. Proceed with the water quantity per the packaging instructions but adjust the total cook time to 10 to 15 minutes. Drain off excess water once cooked. How to Wash Leeks: Cut off and discard the leafy, dark green end on each leek but keep the root intact. Thoroughly rinse the exterior of the leek, peeling off the outer layer if necessary. Starting at the end opposite of the root (the root will keep the layers together), chop the leeks into circular rounds. Place the leek rounds into a bowl filled with cold water. Swish them in the water to help dislodge dirt or any other impurities, which will collect at the bottom of the bowl. Pay extra attention to the greenest colored rounds, or those that were connected to leafy end, as they tend to be the dirtiest. To remove stubborn dirt, remove the center of the leek round and massage the outer ring layers with your fingers until the dirt is released. Reassemble the round if you like or leave the centers and rings separate. Transfer the leeks to a colander and rinse once more before drying with a towel. Coconut Milk: I use the coconut milk brand Thai Kitchen. If you don’t have any coconut milk on hand, substitute with a plant-based milk or turn the dressing into a vinaigrette. How to Make a Curry Vinaigrette: Substitute the coconut milk for 2 tablespoons of coconut vinegar or apple cider vinegar. Where to Find Mango Chutney: Look for this Indian condiment in the international aisle, Indian grocery stores or online. There are many chutney varieties, such as sweet, spicy or hot. For this dressing, I use the brand Kitchens of India’s Sweet Sliced Mango Chutney. Recipe adapted from Food for Thought with Claire Thomas. Recipe was doubled for photography purposes.